The price shown is for 1 tube of ten tablets. Also available is 6 tubes of 10 (60 tablets) for $45.00 - that's $7.50 / tube of 10 tablets. 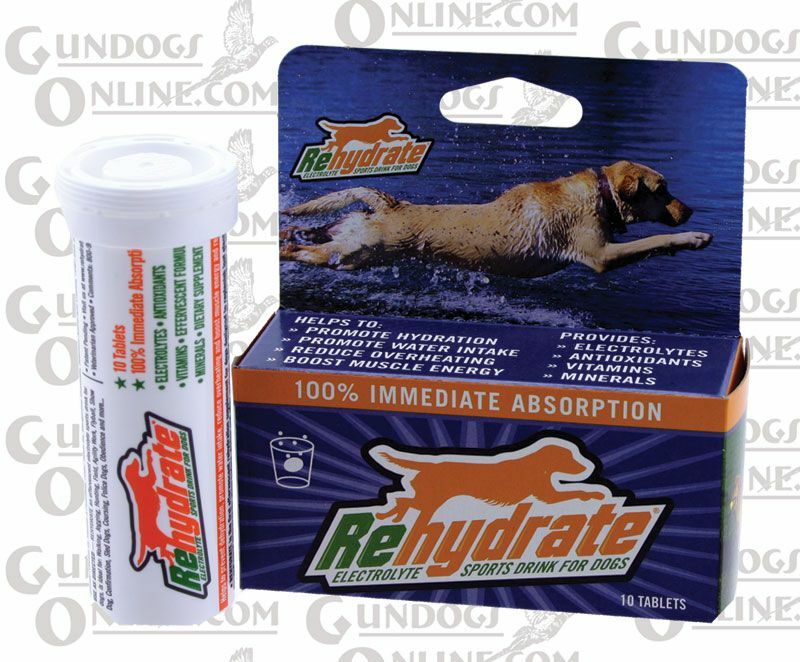 Rehydrate is the first effervescent dog first aid rehydration supplement for dogs designed to replenish lost electrolytes and spent energy to be given before, during and after workouts, play or vigorous activity. Rehydrate is a fast-acting formula that once dissolved in water provides a performance drink fortified with appropriate levels of potassium, sodium, chloride, vitamin C and other important vitamins and minerals. Rehydrate helps prevent dehydration, promotes water intake, reduces overheating and boosts muscle energy and recovery. Unlike traditional powdered products that mix with water and require pre-mixing of measured doses, Rehydrate comes in an easy to use tablet form that dissolves quickly in water with an effervescent. One tablet is used with 16 ounces of water to provide fast-acting relief and energy boost. Multiple tablets can be easily packed and used in the field or at home and simply added to water to create an important canine supplement. Active dogs, including retrievers, pointers and others that have great enthusiasm, often exert themselves to the point of danger. Many become too excited to eat and importantly drink enough fluids during or after exercise. Keeping canine partners hydrated while hunting, training, jogging or other forms of exercise is essential, in warm or cold weather. Because dogs regulate heat through their tongue and footpads, methods more difficult to monitor than human sweating, understanding a dog’s need for fluid replacement is vital to help monitor their heart rate and core body temperature. Even if a dog is drinking enough water, it may not be maintaining critical levels of energy-boosting electrolytes such as potassium, sodium and chloride that Rehydrate provides.